For anyone who’s beginning to see a pattern, you’re not imagining things. We’ll be looking at lots of different things related to Shadowland in the weeks ahead because there are many angles to explore. Last week, the solicits for September were released, revealing quite a few things about who we might find on Matt’s side. 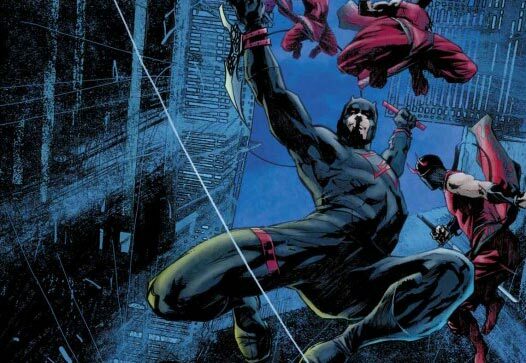 The image above is from the unlettered sneak peak of Daredevil #508 that was released last Thursday and gives us the first “in comic” appearance of the new black costume that had previously been hinted at in one of the teasers (below on the right, click to zoom) released previously. A few things stand out right away. First of all, we see the addition of a couple of seriously scary-looking blades – though I must admit that they also look pretty dangerous to the person wearing them. The preview art above shows only one blade, and I suspect that they are intended more as a tool for intimidation than as actual weapons. Not that the new and darker Daredevil doesn’t have it in him, but these blades don’t look very practical. Secondly, the costume still contains a bit of red, as an accent color. The famous double ‘D’s look a little edgier and a little rougher (did Matt draw those himself? ;)) but are still red, and match the billy club holster. There’s been some speculation on Daredevil’s red eyes, but one thing to remember is that the mask he usually wears also has red lenses, even though they don’t come across as quite as striking, and it doesn’t necessarily mean anything. 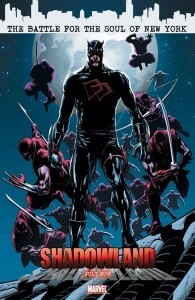 For historical comparison, and for your viewing pleasure, here’s a list of Daredevil’s lesser-known previous costumes. We have the old yellow costume, and the short-lived armored costume from the 90’s that, in an interesting coincidence, premiered during the Fall from Grace storyline which was the last time Daredevil encountered the Snakeroot. I like the new look. I think it’s totally fitting for the new mood of the character, no to mention that, if Matt’s going “to the dark side”, a new look would be essential. After all, comics rely heavily on our visual experience (thank you, captain obvious). I also love the old-school yellow outfit, and considering the hideous things we saw during the 90’s, the armor look isn’t half bad. The new dark suit actually reminds me of the armored outfit in color, the eyes, and having action on the forearms. I don’t think that vibe (and the timing) is an accident (maybe this is also a bit Captain Obvious). Does anyone else think it’s funny that DD’s ninjas rock the horns? Who is the Hand’s tailor? OH MY GOD IS GLADIATIOR IN THE HAND NOW! 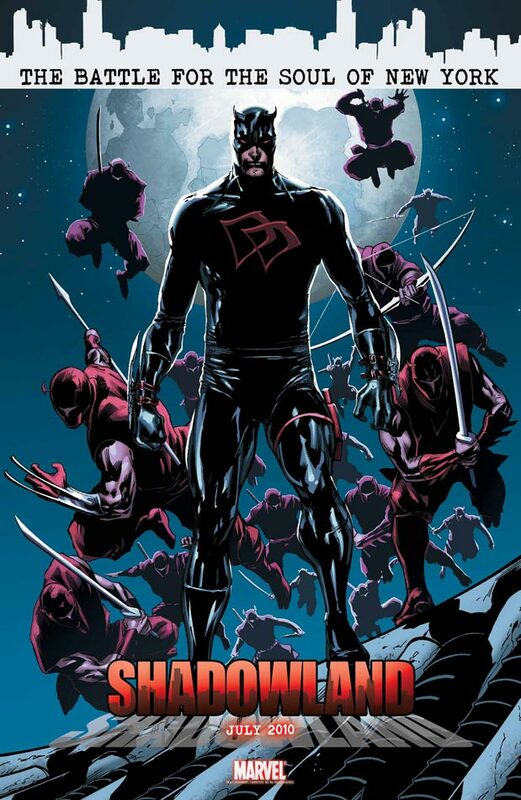 Maybe I’m crazy, but I’m TOTALLY on-board with “Daredevil as a bad guy”(or at least a bad guy in the eyes of the MU). This is a guy who has the perfect villain origin story: aggressive then killed father, crappy neighborhood, crappy school kids/bullies, lost of sight, damn near everyone he’s ever loved has died…Murdock’s got a rough life. And its not like he’s been such a goody-good hero anyway. He has no qualms with purposely crippling people like Bullseye and the Owl, torturing folks or just plain walking into a seedy bar and beating the crap out of people. He’s tried so hard to make the world a better place, despite all the torment he has faced(and the pain he deals out). And now, that he has an entire organization of ninja assassins on hand? I think the steps he’s taking is perfectly in character for Matt Murdock, and I’m totally on board with it. 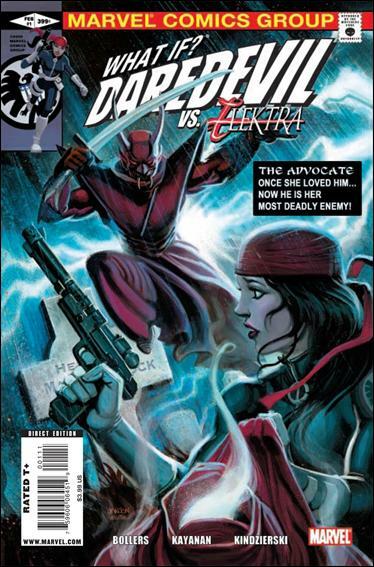 I quite liked the costume from the what if , daredevil v elektra one-shot. If they wanted to give him a proper evil look something like this would have been better. I do like the new one tho. Must say… the bladed forearm guards are a little silly. I’m sure Matt can make some use of them but… They don’t look very offensively useful… and as far as defense goes I can only see those digging into his arms. they should have another strap further up the blade, as it is the top of the blade looks like it will just dig into his arm. I’m not really onboard with the new costume. I really can’t stand the D’s and blades. I don’t mind the black as much, though I do think it’s really cliché. The whole tired “good guys wear white, bad guys wear black” routine, but hey we are talking comic books. From a hype standpoint, I understand changing the outfit to help the event make a bigger splash, but this just comes off as very unimaginative to me. To me, the simple red tights are much more menacing than this evil twin could ever be. If they had to change the costume, it would have been nice to see something that taps into Matt’s dark side. Something more than changing the color of the tights to black. Something more than just the obvious “evil twin” costume. As Pete said above, something like the costume from the What If issue would have been cool. I love that issue as well as The Advocate’s costume! Very striking and different. But a costume like that would have been a drastic change and with all the drastic change already going on perhaps the creative team thought a big costume change would have been too much. Still, I think it would have been interesting for the DD team to push a more impressive costume change or skip the cliché costume change altogether. I really don’t think a new look is essential to this story. From a visual standpoint, I understand it’s appeal, but for me it doesn’t really add anything to the story. In fact, I think it would have been more interesting if they kept him in the red tights. Matt is giving in to tendencies he has had from the beginning and occasionally lets loose. Matt has a capacity for evil that has always been under the surface and kept in check. With his origin, Matt could have been a villain from the start, as Jeremy said above. This is also something Frank Miller touched on in the DD comic documentary included in the theatrical cut of the DD movie. Why do you think Stick did not ask/allow him to become one of The Chaste? He isn’t corrupted like Elektra, but he has these tendencies that make him unreliable to Stick and his group. He’s a bit of a wildcard. Still an ally, but not right for full membership. If he had been less like his father, we may have very well have had Matt Murdock the villain in the red devil tights. So because he’s giving in to something that is a part of him, I don’t really see the need from a story perspective to change the tights, especially since the change they made is basically an “evil twin” version of DD. But this is a visual medium so things like costume changes have to be considered.